Skola Vowel cars review. Read detailed review of What does the toy contains, how to play with it it, will we recommend it to other parents. So some of you may remember that few days back I wrote an article on Diwali gift ideas for kids. There I had mentioned that I am searching for a Diwali gift for my son and was considering Skola toys. Imagine my surprise, when Skola toys came across my blog and offered to send me a toy as a gift. So first of all Thank you so much Skola, I love this gesture. Now before I write further, I have got collaboration offers from some other toys companies after I started sharing my toy reviews in our parenting community, but I choose to write about toys that I personally have bought or would like to buy for my son. To others I politely refuse. So you can count on me for my reviews as writing blogs is something I do for passion and for sharing my experiences and not for money. So lets talks about Skola Toys vowel cars. So read on for my detailed review of Skola Vowel cars toy. The first thing that I noticed when I received the toys was its packaging. I liked the red and white doodle box packaging. I am used to receiving amazon packets in simple cardboard boxes but this was different. The box itself could be used for coloring and they had thoughtfully included a box of crayon inside. Another thing I noticed is the booklet/pamphlet wrapped around the box. I was not sure what it was – as usually I have not seen toys coming with such pamphlets. Well I was in for a pleasant surprise. This pamphlet was the part I loved most about the toy. Here was a guidance on how to play with the toy and also various play stages associated with it. God only knows how many articles I have read after my son was born to understand words like fine motor skills, hand eye coordination, gross motor skills, cognitive skills and the hours I have sent in selecting a toy right for my sons age based on what he can do with it. For me selecting toys has never been easy because there are so many factors to consider – price, material, what skills can the toy help in, is it something as per my son’s current interest and so on . With the amount of toys I have bought I can easily write an article on how to buy toys for kids. Well, that is a good idea for my next blog ! I think I will do it soon. When I was going through the guidance provided on how to play with this toy or activities my kid can do with this toy, I came across few words which I knew and some which i did not. I will try to include some information about these words in small information boxes as we progress so that you do not have to google the same words again. The second this that my son did it with impromptu is making a train. Well because one of his current love is also trains :-). By the way did you notice its him trying to experiment with 1 dimensional structures both horizontally and vertically without him even realizing what he is doing. One of the concepts of STEM being applied. You can read about what is STEM in early childhood development to understand more on STEM. Another way to use this toy will be use it as a shape sorter. Since each vowel is different you can stack only one set of cars in each vowel attached to a base. So since we have already done shape sorting that is the third activity he did with these set of cars. Please note that I did not have to get involved in any of the activities till now. And that is the beauty of playing with open ended toys. These cars can also be used for teaching concept of counting. I personally think numbers are an abstract concept but counting is something that me and my preschooler do together. The idea to talk about such concepts is to help him know and understand the world around him. So that while we are travelling he can tell me he saw two cars or while we are in our balcony he can tell me that he spotted three squirrels and so on. This game can also be used to talk about each picture on the car shape, use them as a prop in other themed activities or just to play a memory game depending on the age of your child. This is something that I intend to use this toy for in future. Currently my son can identify words and knows the sounds of certain consonants but does not yet know the sounds of vowels yet. But he is going to be three soon so I plan to learn phonics and introduce it to him. So we can soon play this game together to learn phonics. Since I do not completely know phonics currently, I was not sure of what are CVC words. So here is what I found. What are CVC words ? Why CVC words are important ? 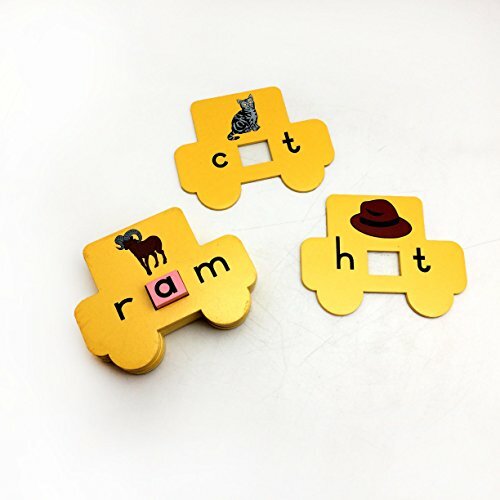 CVC words are the easiest to start with to develop Phonemic awareness which is critical to help your kid learn to read. These words allow kids to understand the basics of reading i.e. one we have to read from left to right. Second since sounds of consonants is usually unique so putting it together along with common vowels kids can understand the transformation of simple sounds into words. 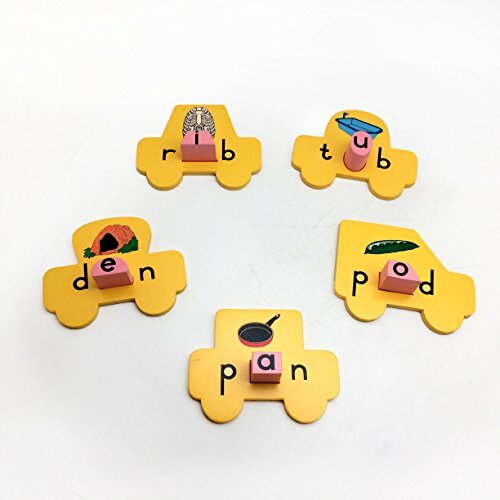 Vowel cars present CVC words in an interesting format – so the cars only have first and last consonants. Where are the vowels are on the car base. And kid has to stack right set of cars on the vowel base (so its like a self correcting puzzle). Also each car shape has a picture of the CVC word. 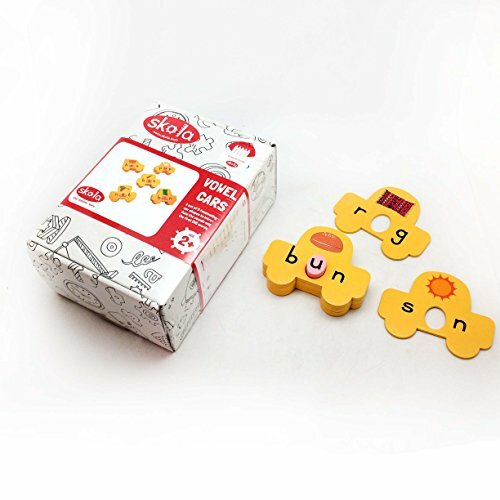 While playing with this game even when I am not talking to my kid about sounds he will automatically make association between a set of CVC words and its pictures and thus effortlessly converting these into long term memory. For e.g. have you ever noticed that nowadays even small kids who can not read can associate contacts stored in your phone with the person who is being called ? This is because they unconsciously associate the written word or in some cases pictures with the object or a person. This particular toy is part of Skola’s alphabet learning journey. I liked this concept of having a set of toys that walks a kid though a specific learning path. I like the thought process they have put for designing toys and creating a journey for a child. To be honest, this is the first thing that attracted me to Skola. To understand alphabet learning journey consider below example. 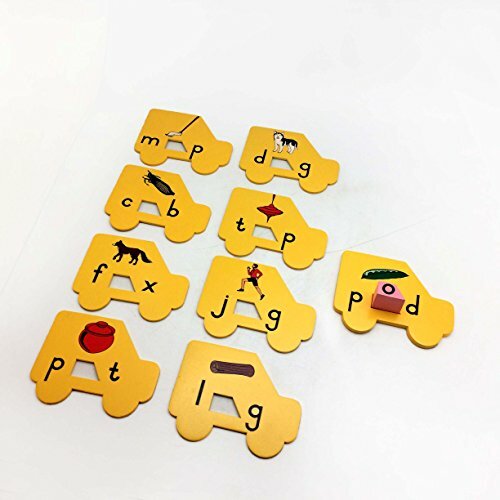 The first stage is to identify shape and sound of each letter, second stage is to develop phonemic awareness of consonants and vowels and form 3 letter words followed by other bigger words, then comes a stage when they learn that they can put words together to form meaningful sentences. So Skola has a set of toys that is designed for each of the above stage. Material – The toys is made of wood and non toxic colours so its safe. Open Ended Learning toys – As I have said in previous articles and I think also somewhere above, I prefer open ended toys with which a kid can do multiple things as opposed to toys programmed to do only few things. But I have a collection of both as I have preferences but am not fixed. We do have a battery oriented train and airplane as well, as my son is in love with them. Child’s interest – This is very important for me as I believe in child led toys, activities and thus learning. A toy may be great but if my kid is not interested in it he will not play with the toy. This particular toy worked for me because my son likes cars, making and breaking towers and alphabets. Also his favorite color is yellow and so are the cars. so these vowel cars definitely worked for us 🙂 . Sturdy – This is another thing that I consider- will the toy be able to stand throwing around and average wear and tear. Since its a wooden toy and looking at the quality it seems it can. To be honest there is nothing that I did not like. As I said before the toy is a little pricey. But if I consider it can be used for stacking and shape sorting (we started with that at 1.5 years), Counting (which we started at 2 years), Phonics (which can be started at 3 years) and understanding basics of reading (can be used maximum till 5) it is definitely value for money. Finally, to summarize will I recommend this toy or the brand Skola to others. Yes I will. 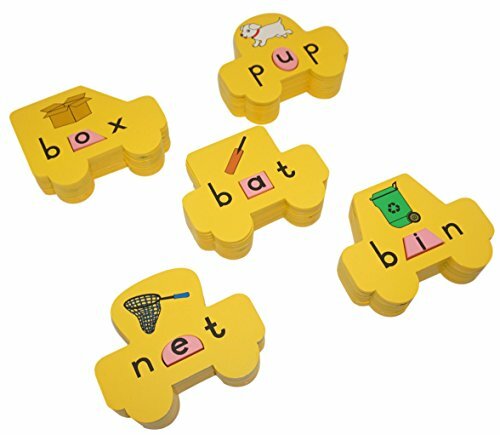 An excellent toy to teach multiple skills and also introduce kids to phonics. If you would like to listen to the my Skola vowel cars review, you can check out the video below. Will I spend my money on skola toys. Yes. There is a list of toys that I like and would like to buy from Skola with time. I will let you know when I buy more. Do tell me if you have any toy from Skola and what is your input on it using comments below? Did you like this Skola toy review ? Do you have a brand of toy that your kid loves. Do let us know using comments below. We would love to hear from you. Thank you for this detailed review. I loved the way these toys help in learning while the kids are playing. Such a detailed review Neha. Very well written. You haven’t left any area untouched. I will recommend this toy to my friends. I wish they were into international shipping. I have been reading a lot about skola toys! They seem to be the best educational toys around. Will check them out. Such an elaborate review..i dont have any doubts about the product. Really awesome review. The toy looks so promising..will definetly buy it wen my son starts learning. Whoa! This is a great educational toy. I will definitely buy this for my niece who is now learning words. Quite a novel toy – havent seen this type before. And one toy, many ways of playing is a win-win <3 Nicely summarised, Neha. Love your review list!